Earth Hour 2010: Feels good, but how about tackling ‘vampire power’? This year’s Earth Hour was observed around the globe this weekend. 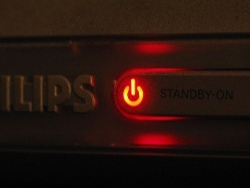 On Saturday 27 March 2010, millions of businesses and households switched off some or most night lights from 8:30 to 9:30 pm local time. An estimated one billion people, along with thousands of cities and hundreds of globally famous monuments, switched off their lights according to the organisers, WWF (World Wide Fund for Nature). I couldn’t participate personally, as I was flying through that night from Amsterdam to Singapore. Originating in Australia in 2007, Earth Hour has become a global event held on the last Saturday of March every year. It asks households and businesses everywhere to voluntarily turn off their non-essential lights and other electrical appliances for one hour (60 minutes) as a way to raise awareness on the need to act on climate change. For sure, Earth Hour is mostly symbolic – we can’t save enough electricity in just an hour to make any dent in our planetary energy consumption. But it reminds us of the need to conserve energy whenever and wherever we can — and reinforces the fact that the climate crisis is very closely linked to how we generate and use energy. 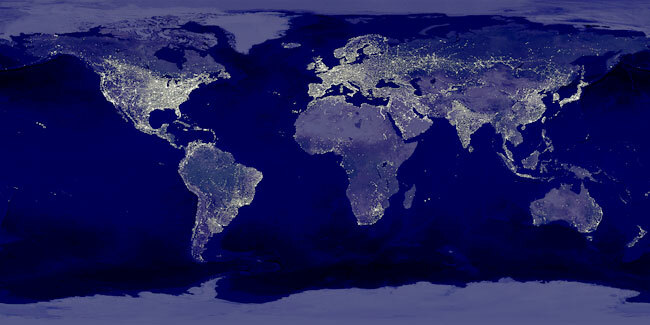 Indeed, night lights are one of the most visible indicators of energy use. In my writing and talks, I keep using this composite NASA image of the Earth at night shows, energy use is also proportionate to the level of economic activity and social development. Asia accounts for a good deal of the world’s lights at night. There is a better way to involve everyone, everywhere in an on-going way to save significant amounts of electricity: tackle the growing concern about Standby power. A large number of electronic and electrical products — from TVs and microwave ovens to air-conditioners — cannot be switched off completely without being unplugged. These consume power 24 hours a day, often without the knowledge of the consumer. This is called ‘standby power’, also known variously as vampire power, vampire draw, phantom load, or leaking electricity. (These vampires draw electricity!). A very common “electricity vampire” is a power adapter which has no power-off switch. Some such devices offer remote controls and digital clock features to the user, while other devices, such as power adapters for laptop computers and other electronic devices, consume power without offering any features. Another example is the typical microwave oven. Over its lifespan, it consumes more electricity powering its digital clock than it does heating food. Yes, heating food requires more than 100 times as much power as running the clock, but then, most microwave ovens stand idle —in “standby” mode – more than 99% of the time. It’s the cumulative effect that matters here. The wasted standby power (vampire energy loss) of an individual household is typically very small, but the sum of all such devices within the household becomes significant. When we add up millions of such households, it suddenly becomes a whopping number. Industrialised countries are now more aware of this situation. “An individual product draws relatively little standby power (see here for examples), but a typical American home has forty products constantly drawing power. Together these amount to almost 10% of residential electricity use,” says an entire website dedicated to this topicby the US government’s top-ranked Lawrence Berkeley National Laboratory (LBNL). Across the Atlantic, the British Government’s 2006 Energy Review found that standby modes on electronic devices account for 8% of all British domestic power consumption. A similar study in France in 2000 found that standby power accounted for 7% of total residential consumption. Further studies have since come to similar conclusions in other developed countries, including the Netherlands, Australia and Japan. Some estimates put the proportion of consumption due to standby power as high as 13%. It also advises consumers to unplug battery chargers when the batteries are fully charged or the chargers are not in use. Technical solutions to the problem of standby power exist in the form of a new generation of power transformers that use only 100 milliwatts in standby mode and thus can reduce standby consumption by up to 90%. Another solution is the ‘smart’ electronic switch that cuts power when there is no load and restores it immediately when required. LBNL also offers advice on how to reduce standby power consumption in our households and offices. Standby power is receiving more attention at the supply end too, with manufacturers and regulators getting into the act. The One Watt Initiative is an energy saving proposal by the IEA to reduce standby power use in all appliances to just one watt. The initiative, launched in 1999, aimed to ensure that by 2010 all new appliances sold in the world only use one watt of electricity in their standby mode. The IEA estimates that this can help reduce CO2 emissions by 50 million tons in the OECD countries alone by 2010 — the equivalent to removing 18 million cars from the roads. Related June 2008 blog post: Broadcasters and climate change: Turn off your lights, but not your minds! 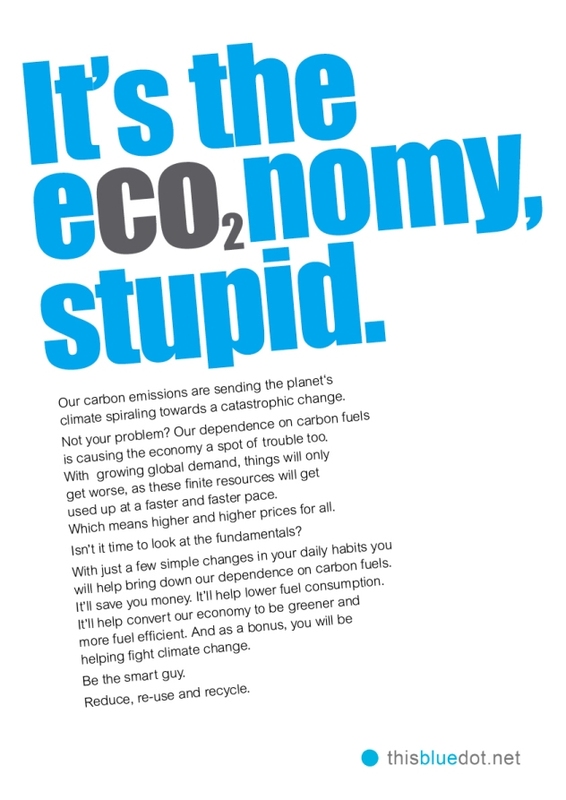 Counting growth on a warming planet: It’s the eco2nomy, stupid! Though not in the same league, this interesting call to action just caught my eye – it reminds us of a slogan that rode Bill Clinton to office in the 1990s, but takes on a whole new meaning now on a warming planet. The reference given, http://www.palebluedot.net, did not have a working website as at today, 27 March 2010. The Stern Review is the most comprehensive, rigorous and terrifying report published todate by a finance ministry. It points out that carbon emissions have already increased global temperatures by more than 0.5°C and that with no action to cut greenhouse gases, we will warm the planet another 2 to 3°C within the next 50 years. This will transform the physical geography of the planet and the way we live, with floods, disease, storms and water shortages becoming more frequent. Stern and his team – no crying-wolf greenies, them – cautioned that the effects of climate change could cost the world between 5% and 20% of GDP, prompting the worst recession since the 1920s. Action to reduce greenhouse gas emissions and the worst of global warming, on the other hand, would cost 1% of global GDP. Now here comes a chance for photographers everywhere to bear witness to the climate crisis slowly unfolding all around us. The Deutsche Welle Global Media Forum 2010 has started an online photo competition called Hot Shots, to bring attention to the effects that climate change is having on people all over the world. Send your photos to hotshots@dw-world.de and show how climate change and global warming are affecting your personal environment. Click here for details on participating and information about prizes. This is one of my favourite photos in media and development. 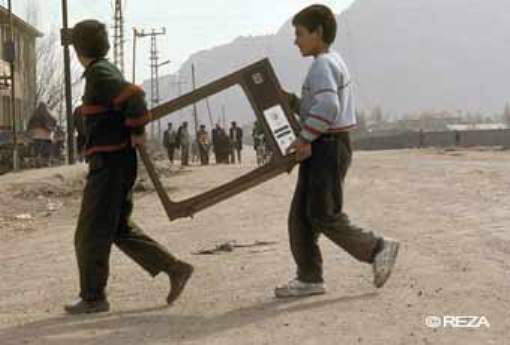 It was taken by Reza Deghati, the renowned Iranian-French photojournalist (who works under the name Reza). I don’t know the story behind this photo, but even without a single word of annotation, it says a great deal. I like this photo partly because it symobolises the enduring appeal of broadcast television in much of the developing world. For long years, the old-fashioned, boxy TV set used to be the top-selling consumer electronic item in the world — until the mobile phone came along. But even now, the much-maligned idiot box hasn’t lost its appeal to a significant section of humanity, never mind what the jaded academics and geeks might say. So I was intrigued to read, in the latest issue of TIME Magazine, development economist Charles Kenny, reminding us that television is still the most influential medium around. In this gizmo-ridden new media age, it takes much courage to say so in public. Kenny’s essay is one of 10 ideas for the next 10 years that TIME has put together for its annual innovation issue. The TIME essay is a much compacted version of what he wrote in November 2009 issue of Foreign Policy magazine, titled Revolution in a Box. That article noted the continuing global spread of television sets and an explosion of viewer choice driven by cable, satellite and digital technologies. It suggested this is a good thing, pointing to evidence that access to competitive television can improve womens’ standing in the home, increase girls schooling, reduce fertility rates, lower drug use, improve governance and (possibly) help foster global peace. The full essay is well worth a careful read. At a time when I have been questioning many of the founding premises of my own work at TVE Asia Pacific, he has provided conceptual clarity and sharper focus. 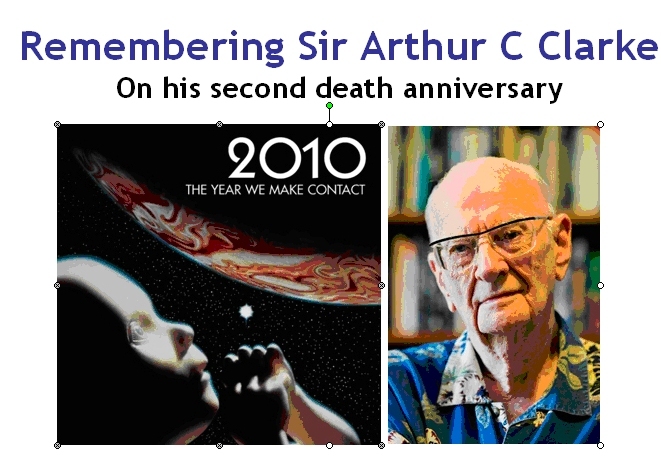 It’s exactly two years since Sir Arthur C Clarke abandoned his 91st orbit around the Sun and headed to the stars. 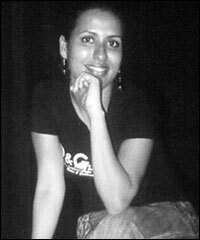 That was on 19 March 2008. 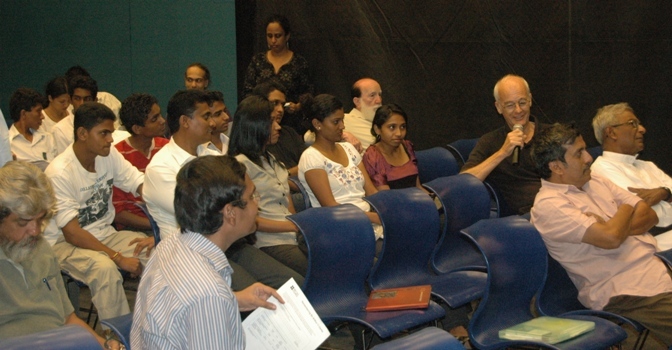 A public meeting to commemorate Sir Arthur was held on 17 March 2010 afternoon at the British Council Colombo. 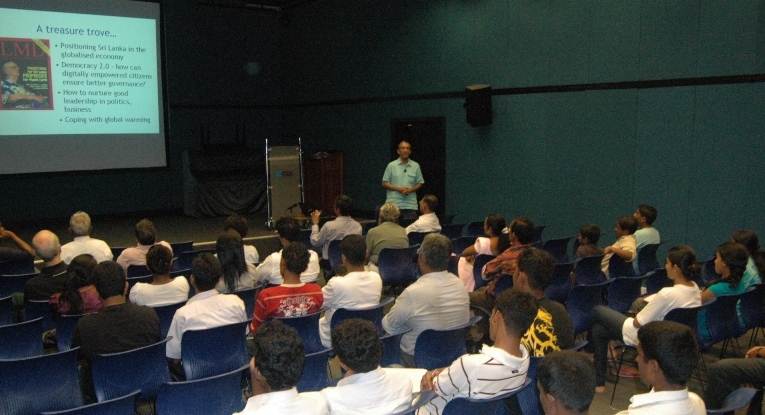 The event was jointly organised by the Sri Lanka Astronomical Association (SLAA) and the Arthur C Clarke Estate in partnership with the British Council. 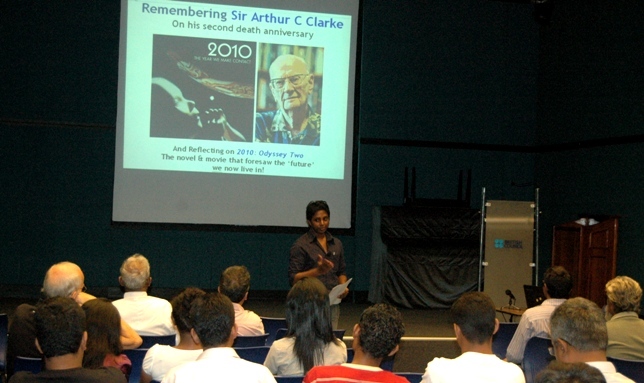 I gave an illustrated talk titled ‘Sir Arthur C Clarke: Man Who Lived in the Future’. We had an eager audience of 65 – 70 persons. Here are some photos from the occasion – a more detailed blog post will follow. The talk will be followed by the screening of feature film 2010: The Year We Make Contact (116 mins, 1984). Directed by Peter Hyams on a screenplay co-written by Peter Hyams and Arthur C Clarke, the film starred Roy Scheider, John Lithgow, Helen Mirren and Keir Dullea. This is the movie adaptation of the best selling science fiction novel 2010: Odyssey Two that Arthur C Clarke wrote in 1982. Where are all the women cartoonists hiding? My daughter Dhara, 13, asked me this simple question earlier this month when I was involved in judging Sri Lanka’s first contest of cartoons on climate change, organised by the British Council and the Ken Sprague Fund of UK. 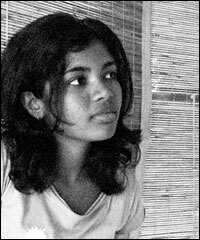 I tried to come up with an answer, and couldn’t think of a single woman cartoonist who works for a print or online media outlet in Sri Lanka. That, despite my long association with the media and also being a great admirer (and collector) of good cartoons. 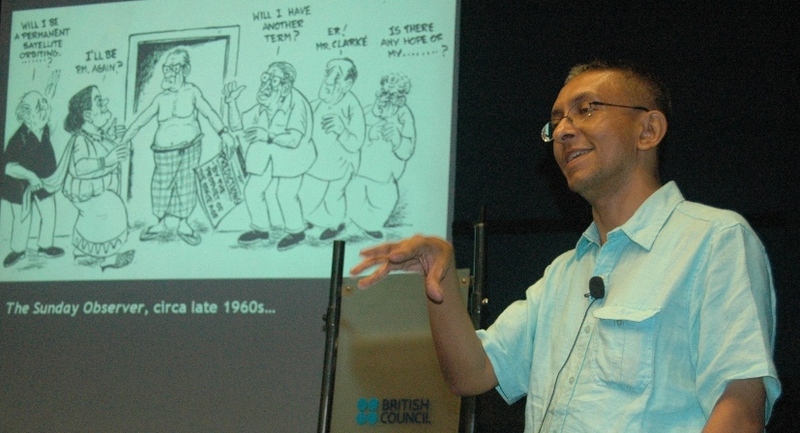 Later that day, at the awards ceremony for winning and commended climate cartoonists, I posed the same question to leading Lankan cartoonists Wasantha Siriwardena, Winnie Hettigoda and Dharshana Karunatilleke. They too couldn’t name one immediately; later, a single name was mentioned but it’s not one I recognised. Clearly, cartooning is still a very male dominated profession — but that might soon change, going by the active participation of young women in the climate change cartoon contest. 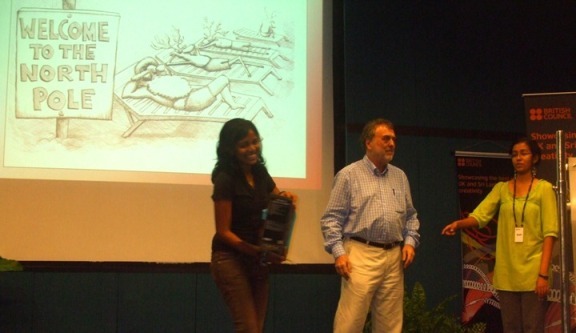 In fact, the first and third prize winners were both women — respectively Shamanthi Rajasingham and W M D Nishani. They beat close to 200 other contestants to get there. Additionally, there were 6 women among the 22 commended cartoonists, and one woman among those 11 who were highly commended — judged on four criteria. See all winning and commended entries. Okay, the four judges were all male (among us, two professional cartoonists). But during this entire judging process, the identity of artists was withheld and we only knew each entry by a number. In fact, we discovered the names (and gender) of artists only at the awards ceremony. 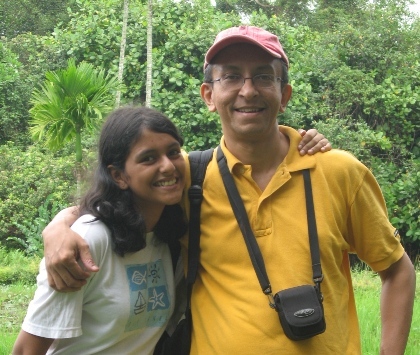 “Good parents are sooo hard to find these days!” exclaimed my teen-aged daughter Dhara recently. She was talking with her tongue firmly in her cheek — I hope! In recent days, she’s been re-reading our collection of Calvin and Hobbes books, where the world’s most cheeky six-year-old keeps making wisecracks about his own mom and dad (‘Your approval ratings among household six-year-olds are way down’, ‘When are you standing for re-election, dad?’, etc.). But Dhara’s light comment rang true, generally speaking. As every parent discovers sooner or later, parenting is a 24/7 job that lasts for two decades or longer. There’s no help desk or emergency number we can call. It’s more an art than a science, for which there is no comprehensive, fail-proof guide — even though plenty of advice is available on TV and online (some of it better than others). Generic advice is helpful but not sufficient. Every parent-child situation is unique, and every parent has to find what works for him or her…ideally, the two parents working in tandem. Does parenting come naturally? If only it did! I don’t believe in this grandma-knew-best kinda romanticising. For sure, some in our grandparents’ generation got it right, but there were also many who never did. Geeks express it a bit differently. “A human being is the best computer available to place in a spacecraft. . . It is also the only one that can be mass produced with unskilled labour,” said the German-American rocket scientist Wernher von Braun, the brains behind the Apollo project that landed men on the Moon. Making babies may be accomplished by unskilled humans in the right age, but raising babies is most decidedly a high skill, high intensity and highly demanding job. Especially in this day and age, when many kids are more tech savvy than their parents: the Digital Natives can easily run virtual rings around their Digital Immigrant parents. We have to watch out, though, to listen carefully to what our children are saying to us — and also about us! By the way, as one of my favourite authors, Roald Dahl, reminded us, “To children, all grown ups are like giants — who tell them what to do all the blooming time!”. (The worst parents in my mind are also created by Roald Dahl’s imagination: Mr and Mrs Wormwood, in his 1988 novel Matilda, which was adapted into a movie in 1996. In the movie, Papa Wormwood tells the precocious little Matilda: “Listen, you little wiseacre: I’m smart, you’re dumb; I’m big, you’re little; I’m right, you’re wrong; and there’s nothing you can do about it!”). The bottomline: am I a good parent? It’s not for me to judge — but I try hard being one. It isn’t an easy act for anyone, and especially for a single parent that I now am. Someday, I hope, the one-woman jury won’t be too harsh on me…and may she never need to advertise for a replacement.